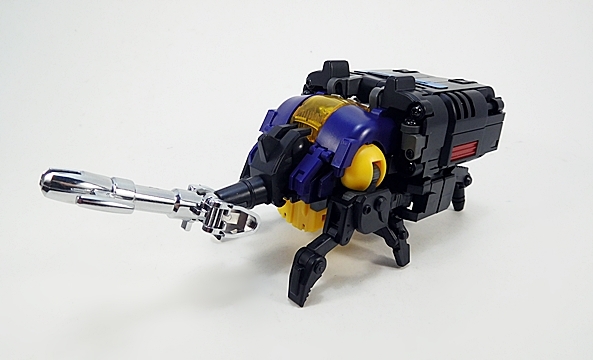 Last week, I kicked off my look at BadCube’s Not-Insecticons with a review of the leader, Claymore, and found him to be an excellent bug-bot. 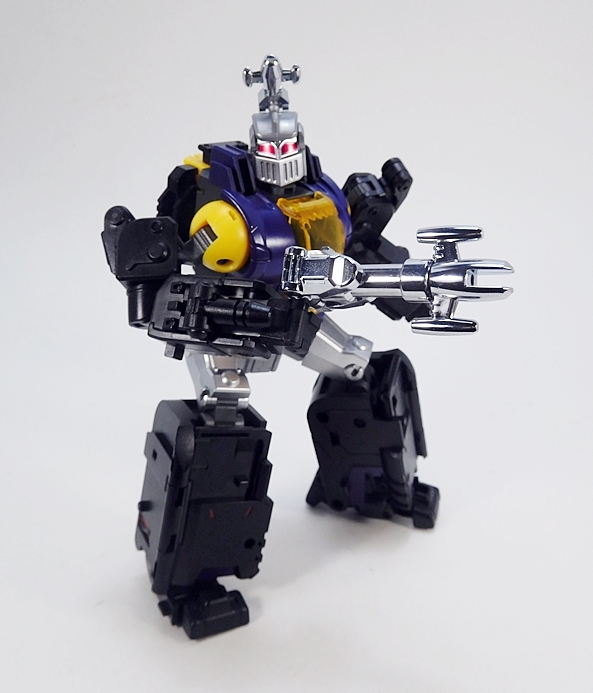 Today I’m pressing on with Hypno, who you could possibly argue is inspired by a certain Transformer called Bombshell. But I’m sure that BadCube’s lawyers would suggest otherwise. 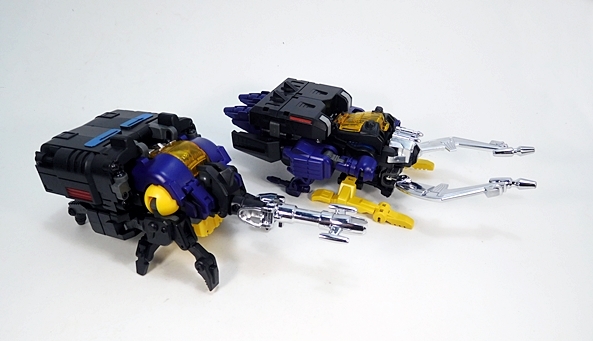 The Bug Corps are scaled to go with Takara’s Masterpiece Collection and as I write this are readily available at a few online retailers for some very good deals. I bought my Bug Corps as a set, but they come individually boxed. The boxes have some nice artwork on the front, but are otherwise unremarkable. 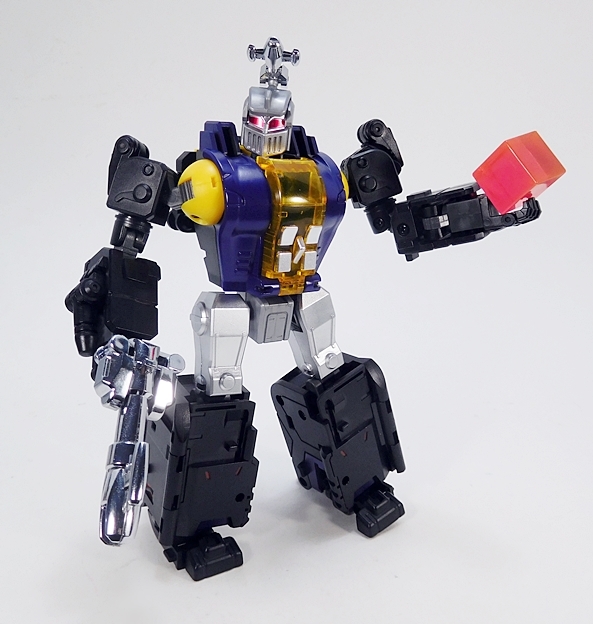 The figure comes packaged in his robot mode, between two clear plastic trays. You also get a beefy instruction book that covers all three figures, a character card, and an Energon cube. I should also note that I’m looking at the “Collector’s Edition” set, which for a little bit more money gives you some chromed parts and translucent chests. Let’s start with the bug mode! 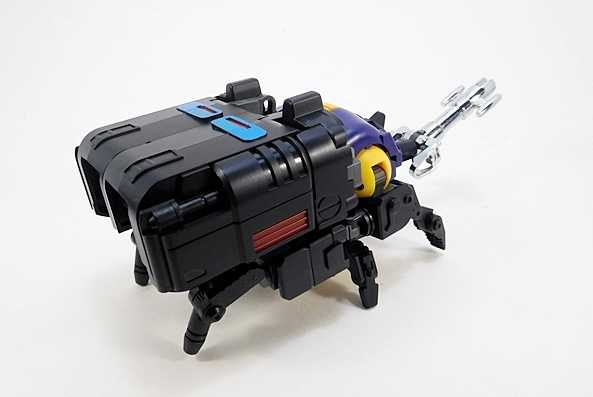 Hypno’s cyber-beetle mode is a fantastic update to the original G1 toy. This new design retains the large boxy body with rounded edges as well as the down swept head, large bug eyes, six legs, and long silver proboscis. He features some simple sculpted panel lines, which are just enough to add detail and still let him keep something of a smooth, animated appearance. 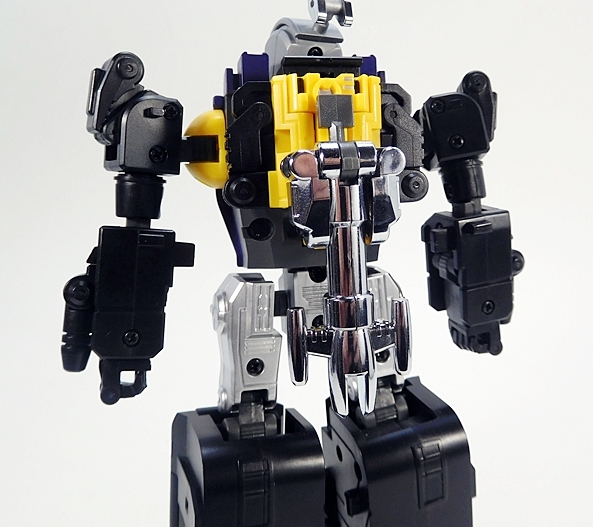 The coloring here features a lot of black plastic, which has a nice satin finish, yellow plastic for his eyes and under his belly, and purple plastic for the head. The deco is rounded out with some red and blue paint hits on the body for detail and that gorgeous chrome on his proboscis. This is a really solid bug that locks together perfectly, and the die cast gives it some decent heft for a figure this size. 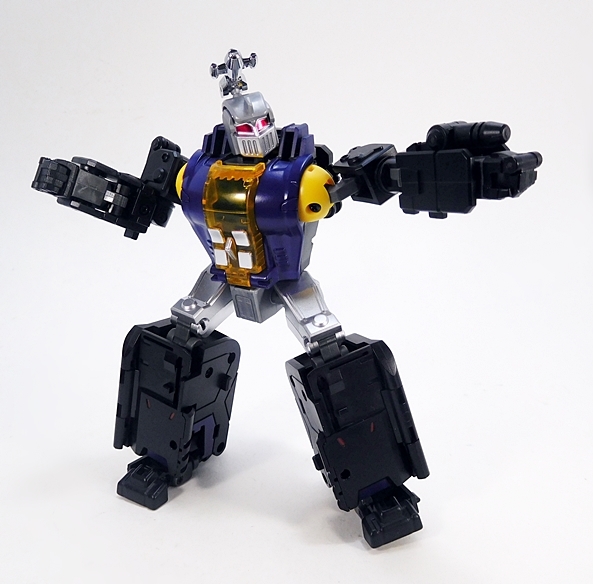 One of the things I dig the most about this guy is his set of chunky and fully articulated legs. Each leg features several strong hinges, and the legs are capable of holding Hypno so that his undercarriage isn’t resting on the ground. I’m not entirely sure why this pleases me so much, but it does. Once again, this premium edition features the transparent yellow panel on the top of the head, and he has some surprisingly good articulation in the proboscis. Not only can it hinge up and down, but the front of it can swivel. 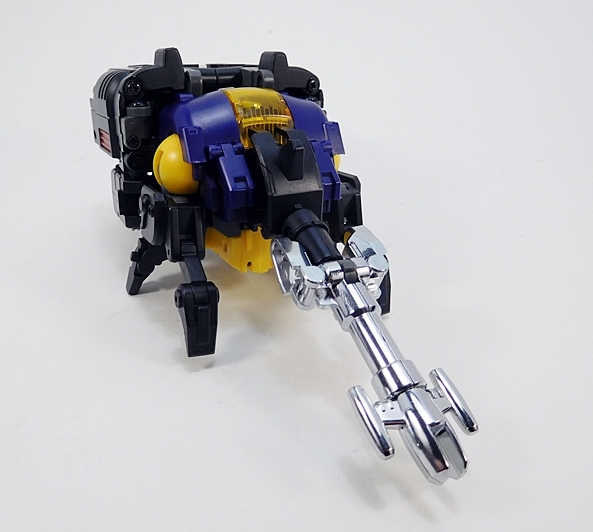 The plate on the front of his head also floats on a joint, so it can move a bit side to side to get an even better range of motion out of that chromed out sucker. 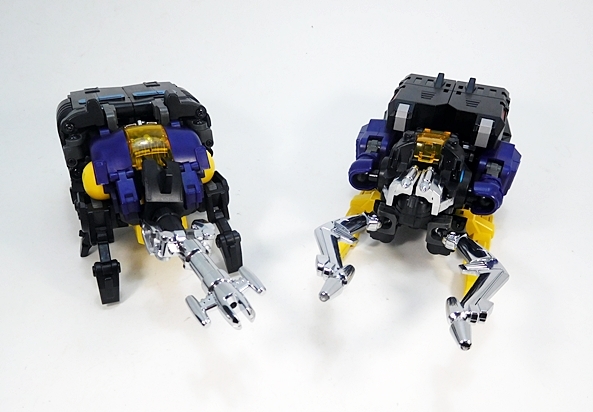 Here are some side-by-side shots of Hypno in his bug mode with other figures. He’s obviously a lot bigger than the original G1 toy, which is no surprise as those were quite small and roughly equivalent to the modern Legends Class. 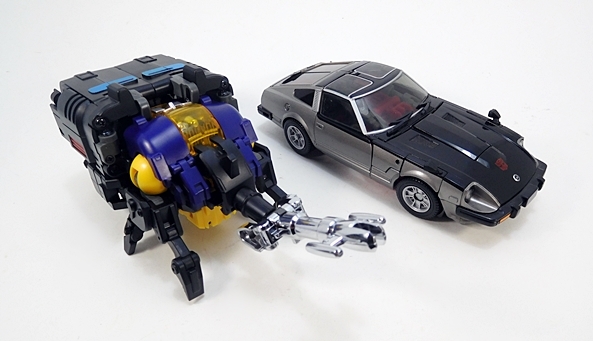 The shot of him beside Streak shows he’s just a bit bigger than the MP cars. 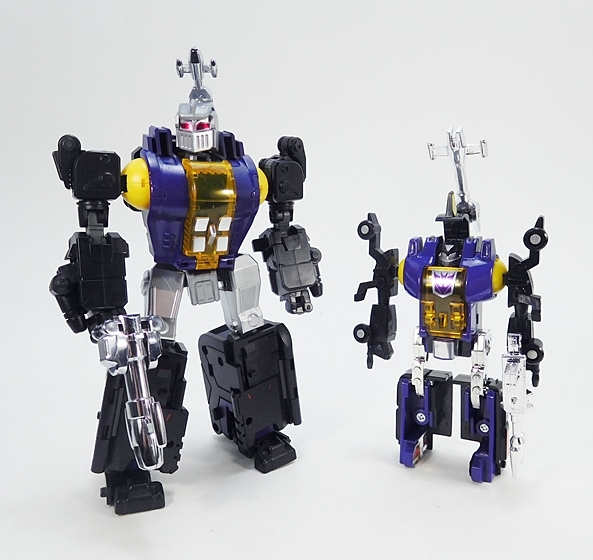 As with Claymore, I think this scale holds pretty well as the original Insecticons were about on par with the original Autobot cars. So far, I’m thrilled with the way this guy turned out, but how about his robot mode, eh? Not bad at all! I found transforming Hypno to be a bit more fiddly than Claymore, but really not by much. A lot of the engineering involves his robot legs packing and unpacking into the back of the bug. 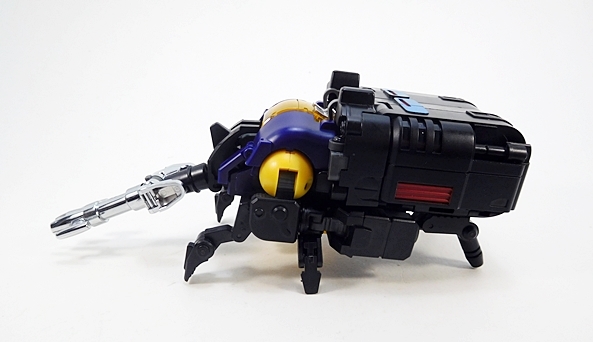 There’s also a clever flip that happens inside his torso to exchange the robot head with the front of the bug head. Another key point worth mentioning is that his proboscis actually detaches to become his weapon in robot mode and I think that works great. 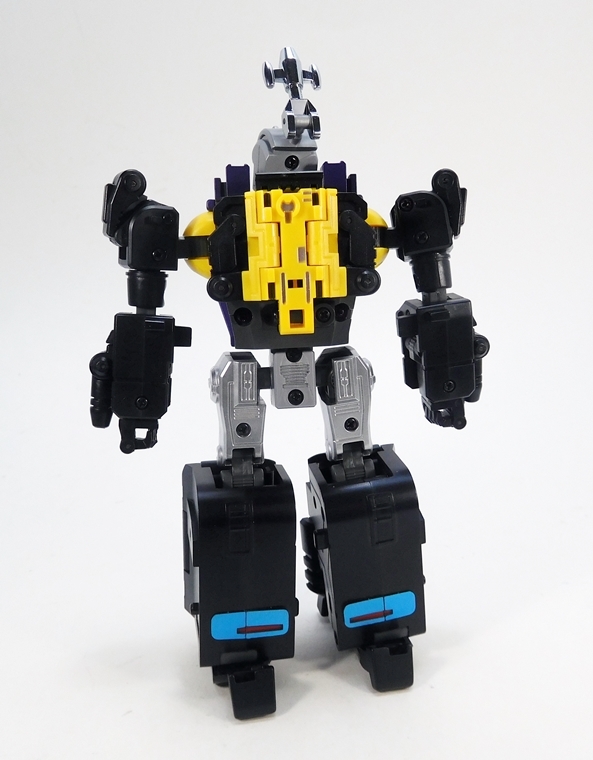 BadCube selected some iconic aspects of the original toy to remain, like the tenuous way the arms attach to the shoulders, but they also streamlined a lot too. There’s virtually no bug-kibble on the arms at all, just the blasters that he has on his forearms. I will say that I think the front of Hypno’s lower legs look a bit unpolished, but it’s not all that bad, and they added some paint hits to help spruce it up. 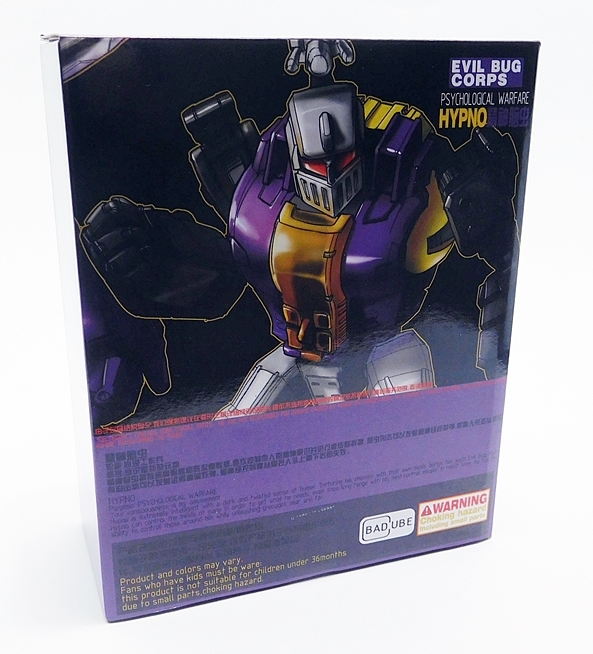 The back of Hypno presents a very clean robot. Again, there’s really no bug-kibble to be seen. Even the two insect legs that reside back here are folded up neatly on his little yellow backpack. The back of the legs look even more refined than the front, with some blue and red paint down near the ankles. About the only thing I can gripe about here are the exposed screw heads, and that’s to be expected. Also, the backpack serves as a storage for Hypno’s gun. It simply clips right on. 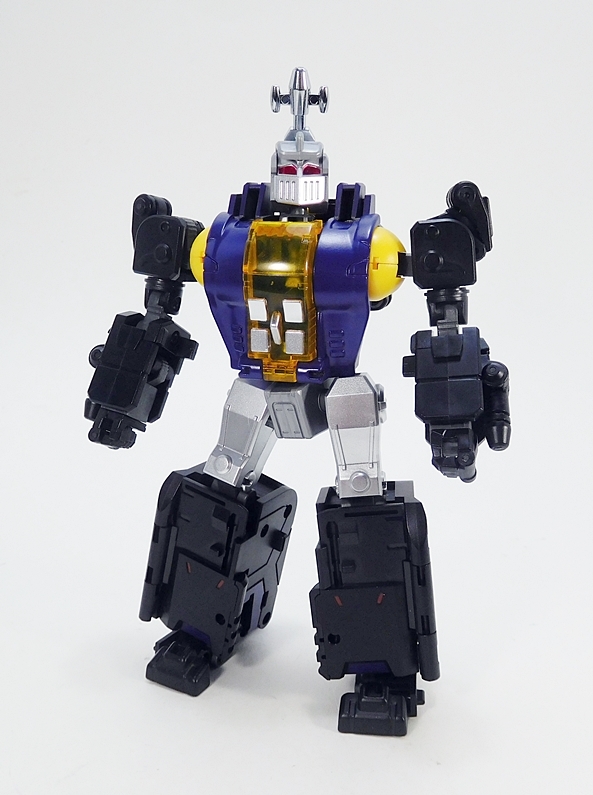 Bombshell always had the most distinctive head sculpt of the Insecticons, and by sheer coincidence so does Hypno! I’ve always loved the mouth plate on this guy. It looks like a knight’s visor. 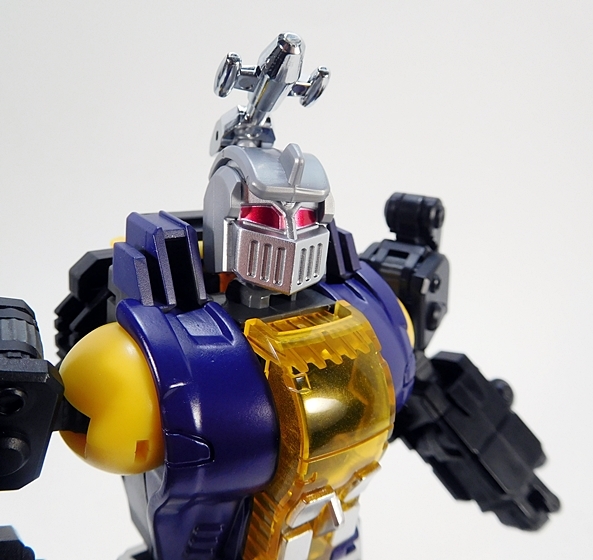 The paint used for the eyes casts a cool shimmer effect, which can look like light-piping from certain angles. And, of course, on top Hypno has a faked out diminished version of his proboscis, which can be angled up and down for firing Insecti-shells. Once again, the chest plate on these “Collector’s” versions is clear plastic and he has some silver painted panels down near his abs. The articulation here is right on par with Claymore. The arms feature universal movement in the shoulders, double hinges in the elbows with swivels, and swivels in the wrists. The legs have rotating hinges in the hips, with some lovely clicking ratchets, double hinges in the knees, and the ankles feature both hinges and lateral rockers. He can rotate at the waist and he has a ball joint in his neck. 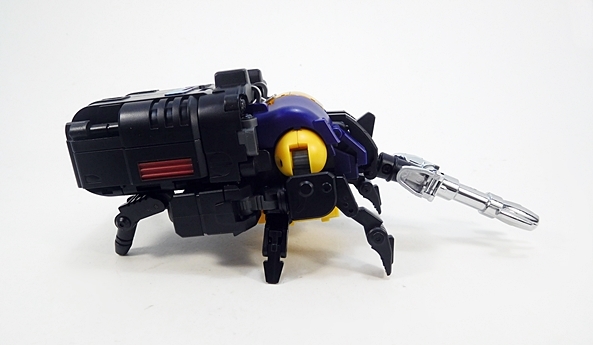 As mentioned earlier, Hypno comes with a chromed gun, which is actually formed from the insect mode’s proboscis. It has a spatula-shaped handle that tabs into a slot inside either of Hypno’s fists and holds it pretty well. 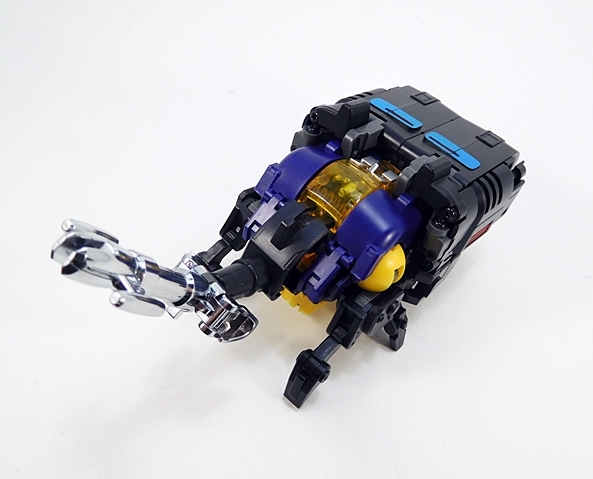 And finally, Hypno comes with the same type of Energon cube that we saw with Claymore. Yup, it’s just a squishy cube of pink plastic, but cool nonetheless. Finally, let’s check out a couple of size-comparison shots. Hypno towers over the original G1 version of Bombshell and he comes up just a little short of Masterpiece Streak, which feels perfect to me. I really dig the way these two styles fit together, making Hypno quite welcome on one of my official MP shelves. 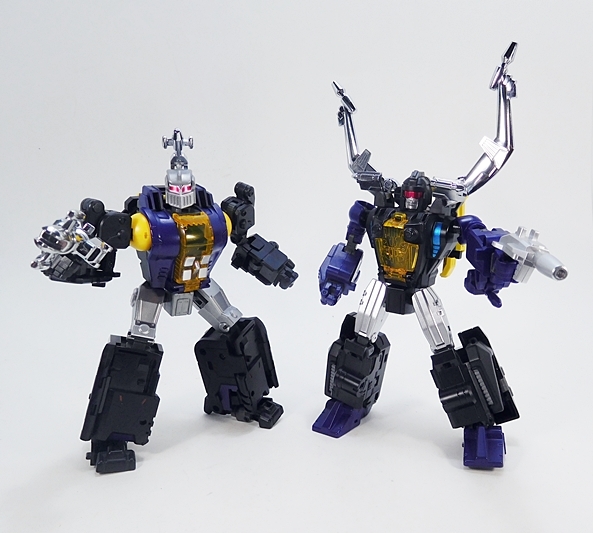 As I mentioned last time, this “Collector’s Edition” of the Evil Bug Corps set me back $140, which makes these guys about $47 each and I think that makes them an incredible value. 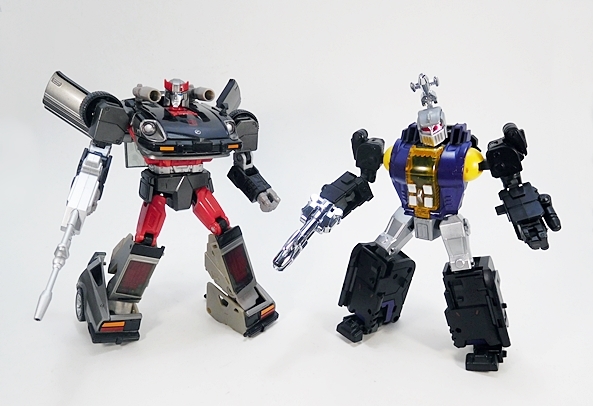 Indeed, it’s hard to find many MP scaled third party convertorobots of this quality for under $50 these days. 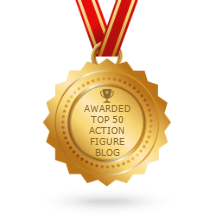 The engineering is complex enough, but not overly fiddly, the tolerances feel fine, and there’s nothing involved in the transformation that feels like it can damage the toy. Yup, in the end, I give Hypno two Proboscises up. Sorry, I’ll never get to use that word again, so I might as well go nuts. Anyway, that’s two bug-bots down and my love for the Evil Bug Corps remains unshaken. These guys look fantastic together, and I’m all the more excited to bring the final member of the trio in next week when I look at Kickback… I mean… Kickbutt! 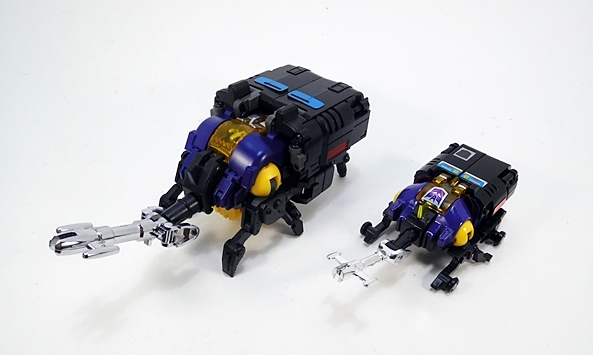 reminds me of my old g1 insecticons!